After a lot of back and forth, South Korea seems to have revealed its real thoughts about deploying the US Terminal High Altitude Area Defense (THAAD) anti-missile system on its soil. According to a Chosun Ilbo report on Friday, South Korea's foreign ministry spokesman Kim Min-seok confirmed that, on stationing a THAAD battery, "Seoul is ready to talk with Washington … if Washington wants to." However, days ago, South Korea considered THAAD as just hypothetical, as its newly-appointed ambassador to China Kim Jang-soo said in an interview with the Global Times on May 18 that "on THAAD deployment, the South Korean government's stance is unchanged" and "Seoul and Washington have not negotiated on it." The same rhetoric has been echoed by many other South Korean politicians and diplomats for over a year, but with the process of preparation unmentioned, now Seoul is ready to meet and parley. It didn't come as a total surprise that Seoul made this decision. Vacillating though it seemed to be, South Korea was actually sounding out the other Northeast Asian countries on their bottom lines, especially China, which has officially raised concerns about the deployment of THAAD in South Korea. With politicians and diplomats serving as lobbyists, Seoul has been trying to discover the tipping point that might trigger China's countermeasures and to persuade Beijing to compromise on this issue. Debates about whether THAAD is a threat to China's national security - the major reason why China opposes its deployment in its neighborhood - have seen disparate arguments between South Korea and China. Many South Korean experts and policymakers, by analyzing technological details of the military equipment, argue that the system won't pose an offensive threat to China. They claim, as how the US always puts it, that the system is aimed at defending South Korea from North Korea's aggression, especially nuclear attacks. Their argument has mistaken "North Korea's threats" for the real driver of Washington's intention to deploy THAAD in South Korea. In fact, THAAD, an integral part of the US national missile defense system, serves Washington's grand strategy, the focal point of which rests on containment of China's rise. THAAD might not be an offensive deterrent, but it will facilitate the US to extend its tentacles right to the red line of China's national security. For example, by depending on the highly advanced AN/TPY-2 radars, a core component of THAAD, US surveillance will be greatly expanded, effectively covering almost the entire Chinese mainland. In other words, the deployment of THAAD will raise high risks to China's national security, a core national interest on which we should not expect any concession. Seoul's inclination to open a negotiation with Washington indicates that South Korea is trying to find a diplomatic balance between China and the US. 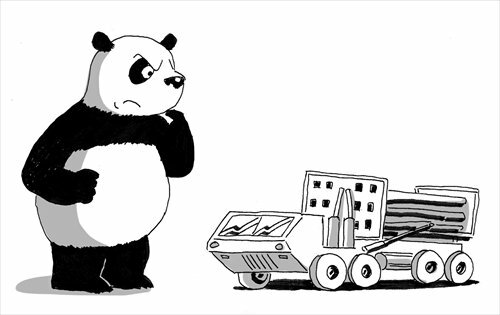 By negotiating with the US about THAAD, it is trying to make up for its earlier decision to turn back on the US and join the China-led Asian Infrastructure Investment Bank. In the short term, Seoul will probably not take a clear-cut stand on the deployment of THAAD, but further its attempt to test how China responds. Although Seoul and Washington might engage in lengthy negotiations about details, it is time for China to ramp up its determination on this issue. The deployment of THAAD is actually a game between the US and China, but it is up to South Korea to make the final decision. South Korea should realize that although its relationship with China is at one of its best times, it doesn't mean that China will unconditionally compromise on essential issues. Seoul mustn't be under the delusion that Sino-South Korean ties will remain the same after the deployment of THAAD. Although nuclear issues are the crux of instability and saber-rattling on the Korean Peninsula, it doesn't mean South Korea has to be fully involved in a vicious circle created by the US in the region. Washington is unwilling to see rapprochement between Pyongyang and Seoul, whose peace and integration would deprive of it a powerful trump card to pin down China's energy, and its grand scheme to sustain hegemony would encounter more resistance. More military assets placed by the US might secure South Korea temporarily, but countermeasures from the North may be triggered. It is possible that in the end, THAAD won't transform South Korea into a well-protected land, but into cannon fodder.